Our revolutionary enzyme supplement gets your gut back on track to healthy digestion. The full Tranont Health line reinforces the flagship [life] enzyme for a healthier, more fulfilling life. Why are enzymes vital for breaking foods down? By nature, all living foods have enzymes in it. Through our cooking practices, we deactivate these naturally occurring enzymes and call on our body's supply of enzymes to do ALL the work. This can be overwhelming! Tranont Health [LIFE] contains a broad array of vegetarian enzymes for every meal and snack. Directions: Take 1 -2 capsules with partially cooked meals and 3 capsules with fully cooked meals or as directed by a health professional. Each bottle contains 90 capsules, a 30-day supply with regular usage. † TRACCSÆ Tested and GMP Manufactured. † TRAACS®, Albion® are registered trade names of Albion Laboratories Inc.
Why [Vibe]? B vitamins play a major role in enzyme activity and influence the production of energy within cells, naturally, without the addiction, jitters or withdrawals. During times of high stress, mood swings, brain fog and exhaustion, our body is demanding high quality nutrients. 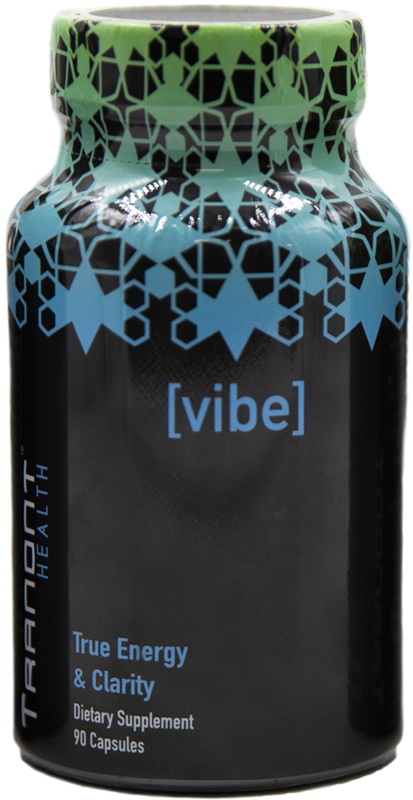 Along with B vitamins, [Vibe] is uniquely blended with Yerbe mate, Ginkgo biloba, DMAE, Rhodiola and Huperzine A for mental clarity, physical adaptation and additional metabolic support. [Vibe] even contains a little touch of theobromine derived from cocao (chocolate) for a steady good feeling. Directions: Take 1 capsule in the morning and 1 in the early afternoon. May take an additional capsule for desired results or as directed by a health professional. Always take with food. With the increase of blood flow near the skin, you may experience a niacin flush that lasts a few minutes. Each bottle contains 60 capsules, a 30-day supply with regular usage. Tranont Health [Balance] is a "foundation product" along with [Life] Enzyme Support. While [Life] helps you to extract the most from your meals, [Balance] helps to replenish your meals with minerals, antioxidants and vitamins for a strong foundation for health. What makes [Balance]'s minerals unique? 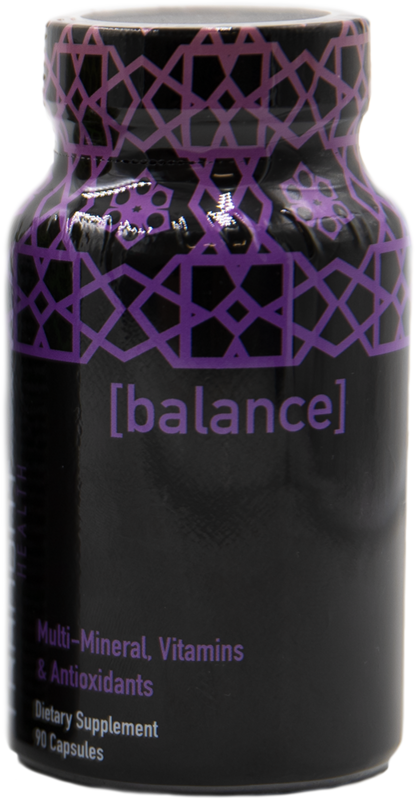 [Balance]'s minerals are special organic mineral elements known as mineral amino acid chelates. Created using science and a patented technology, these chelates gives the body the ultimate chance to absorb for the best biological advantage. Science makes all the difference. [Balance]'s vitamin C is derived from Acerola cherries, giving you the best form for absorption over synthetic or isolated varieties found in other products. [Balance] also contains a blend of foods to boost phytonutrient intake, along with a blend of nutrients (grape seed, grape skin and pine bark extract) with antioxidant properties. Antioxidants help to support healthy cellular function throughout the body. The final touch is the addition of a blend of vegetarian enzymes to support the breakdown of the food components within the formulation. Directions: Take 2 to 3 capsules daily, preferably with meals or as directed by your health professional. TRAACS®, Albion® are registered trade names of Albion Laboratories Inc.
We’re going to change the world, one household at a time. Learn how Tranont’s Wealth CORE services Manage, Protect, and Grow your money. Learn how to build and improve your credit score to save more money on car and home loans. Tranont Credit Services teach you how to improve your credit score or fix errors on your credit report. Our process begins with setting your financial goals and identifying the most important habits and actions to help make them a reality. After gathering all the necessary reports, our evaluation will determine what steps we need to take to correct your report and improve your score. We take action and begin correcting errors and erroneous data on your report using our proprietary system and team of industry insiders. Most clients see positive results within 45-60 days. Improved scores allow you to save money with better rates and lower payments. *Disclaimer: Individual results may vary. Not all items are eligible for removal or deletion from your credit reports. National Credit Care consultants only provide information based on state and Federal consumer protection laws such as: Fair Debt Collection Practices Act (FDCPA), Fair Credit Reporting Act (FCRA), and Telephone Consumer Protection Act (TCPA). We use best efforts to improve your credit scores and reports, but accept no responsibility for negative financial performance including, but not limited to, missed payments, frequent credit inquiries, debt abandonment, or bankruptcy/court filings. Contact us if you have specific questions before enrollment. Protect your hard-earned assets from legal liability. Our legal team will help you legally safe-guard your personal assets and businesses. Personal, family, and business packages available. Tranont Legal is a service for Associates and their families. As legal needs arise, our partnership with Corporate Service Pro makes it easy for you to get quick and effective legal advice that is just a phone call away. Individual, Family, and Business services available. We believe you and your assets should be protected from the unexpected at all times which is why we partner with attorneys who specialize in many different aspects of the law to give you the best advice possible. Work with a team of accounting professionals to get more relief from your tax burden. Personal, family, and business options available. *To be eligible for this service, associates must be an active member of Tranont for 6 months of the tax year, be in good status and active at the time of the tax filing. Protect your ID and bank accounts from hackers. Plus, get expert help with all your online defense needs including virus protection and instant tech support. Personal, family and business packages available. Protect your identity, your privacy, and your money. Doesn’t it seem like there is always some new HUGE data breach that probably affects you? Protect your ID with million-dollar ID theft with Tranont. But protection doesn’t end there: our Tranont partners are there to expertly help you with all your online defense needs including virus protection and instant tech support. Personal, Family, and Business Solutions. The Tranont Defend suite of protection services gives you maximum protection at special discounted rates. Choose the plans that are right for you. Complete personal and family identity theft monitoring and recovery services for all types of identity fraud – plus extra protection benefits not available in other services. Unlimited security and tech support services for your PC/Mac computer and mobile devices. Save hundreds on repairs, tune-ups, security checkups and maintenance. 24/7 monitoring of your Facebook, Instagram, Twitter and LinkedIn accounts for slander, bullying, harassment, privacy risks and more. *Services vary in Canada and other territories. Taxbot is an application that allows you to track and organize all your expenses to help you get the most out of your yearly tax refund. It makes it easy to keep track of business expenses, receipts and mileage from anywhere in the world using your smart phone or tablet. This business expense tracker is also very motivating to use because it keeps a running tally of the potential savings you are racking up by documenting your deductible expenses. The mobile app integrates with your phone’s GPS to determine where you are and where you are traveling to. Your route will be logged automatically and you have the ability to categorize each trip between personal and business travel. Taxbot allows you to maximize your business expenses and be meticulously prepared at tax time. Make owning your own business easy. Track your expenses and tax-deductible mileage with TaxBot. The only mileage and expense tracker you’ll need. Let TaxBot help you manage complicated accounting with automatic mileage tracking and categorizations of bank and credit card transactions. Get instant online access to immediate treatment for non-emergency medical conditions. Talk directly with physicians, behavioral health services, Registered Dietitians, Fitness Trainers, and more. Individual, family, and group options available. Controlling the cost of healthcare is a daunting task. We have made it easier, less time consuming, and we have put the products needed to care for the patient as a whole person, all in one place. The Health Savings plan CORE product offers instant online resources and gets you access to immediate treatment for non-emergency medical conditions. You’ll also save BIG with our personal and family medical cost sharing program as an insurance supplement. Personal, Family, and Group options available. Licensed Registered Nurses, physicians, and other practitioners are available for consultations to diagnose non-emergent medical conditions. They will consolidate your information, develop a treatment plan, write prescriptions as needed, and utilize the pharmacy of your choice. Your physician can also request a variety of lab tests that can be ordered and administered in the convenience of your home. *This is not insurance. Not available in all areas.